Ultralight Polyproplyene Scrim - an ultralight thin base that the cotton/poly fibers are needle punched through. This base adds a layer of stabilized strength that allows the extra "tug" or "pull" and helps reduce any "hand prints", stretch or puckering as you are working with the batting. Scrim has a melt point of 250F. 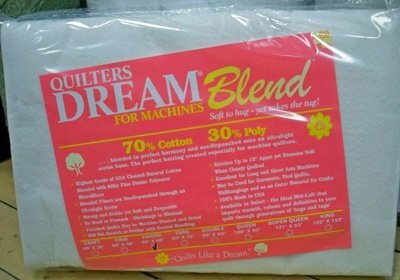 To maintain the soft suppleness of your quilt, dry on low temperatures, do not use a commercial dryers and use a low iron setting. If you dry-clean your quilt, advise your cleaner. Special processing - we use state of the art manufacturing. The fine denier poly and cleaned cotton fibers are opened, combed, blended and carded. To add extra strength and prevent "naps", we go another step and cross-lap the fibers into a fine consistent web or pad. This is layered with the scrim and specially needle punched using thousands of saw-like needles that interlace the fibers through the soft scrim base.